A new era for NASCAR racing at the Indianapolis Motor Speedway will feature even more excitement, as Big Machine Vodka was named the title partner of the annual Monster Energy NASCAR Cup Series event at IMS. The Big Machine Vodka 400 at the Brickyard is scheduled for Sunday, Sept. 9 on the 2.5-mile oval at IMS. The 25th annual NASCAR weekend at the Racing Capital of the World is moving from the heat of late July to cooler temperatures of early September, and the Big Machine Vodka 400 at the Brickyard also will serve as the thrilling finale to the Cup Series regular season, setting the field for the Playoffs. This multi-year title rights sponsorship further strengthens the nearly decade-long partnership between Big Machine Records and IMS. "Our friends at Big Machine Records are the perfect partners for NASCAR racing at IMS, and the addition of Big Machine Vodka as the title sponsor for the Brickyard 400 sets the stage for an awesome weekend of motorsports and entertainment at the track," IMS President J. Douglas Boles said. 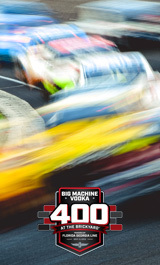 "The Big Machine Vodka 400 at the Brickyard will be a can't-miss event on the Indy sports calendar as we crown NASCAR's regular-season champion and celebrate with a fantastic new sponsor." Big Machine Platinum Filtered Premium Vodka is 25X Distilled and 3X Platinum Filtered to make it "The Best Tasting Vodka, Period!" The lifestyle surrounding this superior-quality and attractively priced vodka will be shared with fans during the event weekend. This will include VIP concert and racing experiences, and other exclusive sweepstakes, packages and promotions. Stay tuned to IMS.com, and IMS and Big Machine Vodka social channels for more details. "The Indianapolis Motor Speedway is the greatest motor speedway in the world, and Big Machine is returning with a vengeance, highlighting great music, our great Big Machine Platinum Filtered Vodka and a full-blown festival atmosphere that fans of racing and music are going to love," Big Machine Label Group President and CEO Scott Borchetta said. "We're armed with a multi-year agreement and intend to partner with IMS to create an incredible Brickyard weekend." Local fans also can enjoy the exceptional taste of Big Machine Vodka well before NASCAR's biggest stars are on track at IMS. By early spring, the product will be available at retailers, bars and restaurants throughout Central Indiana. Led by Founder, President and CEO Scott Borchetta, the Big Machine Label Group encompasses Big Machine Records, The Valory Music Co., BMLG Records, Big Machine Records/John Varvatos Records and publishing company Big Machine Music, as well as its own digital radio station, Big Machine Radio. BMLG artists include superstars Taylor Swift, Rascal Flatts, Reba McEntire, Florida Georgia Line, Thomas Rhett, Brantley Gilbert, Ronnie Dunn, Cheap Trick and Sugarland; chart-topping acts Justin Moore, Eli Young Band, Brett Young, Aaron Lewis, Midland, Carly Pearce; "The Voice" winner Danielle Bradbery and 2015 "American Idol" winner Trent Harmon. BMLG artists have received multiple GRAMMY, CMA, ACM, AMA, CMT, Teen Choice, MTV, Billboard , People's Choice and Brit Awards. Big Machine is the first-ever American label to align with terrestrial radio for performance royalty rights for its artists and is an industry leader in fighting for artist, songwriter, publisher and record company rights. BMLG's racing successes include back-to-back Indianapolis 500 wins with the late Dan Wheldon and Dario Franchitti in 2011 and 2012, respectively; the 2015 Rolex 24 At Daytona overall victory with Tony Kanaan; the 2014 12 Hours of Sebring victory with Marino Franchitti; and associate sponsorship with John Force Racing for the 2018 NHRA Funny Car Championship with Robert Hight and the Top Fuel Championship with Brittany Force. The company is in its fourth year sponsoring Tony Kanaan, the 2013 Indianapolis 500 winner and 2004 IndyCar Champion. Visit BigMachineLabelGroup.com for more information. Visit IMS.com for more information and for tickets to the Big Machine Vodka 400 at the Brickyard.